If you are obsessed with Game of Thrones like I am, you are probably still reeling from Sunday night’s episode (Season 5, Episode 9). By now, we all know that Episode 9 of each season brings with it some pretty gut-wrenching and memorable moments. Still, this episode went beyond what I would have thought of as in bounds for this highly controversial show. Even though I could barely watch one scene (you know the part I’m talking about), it’s cringe-worthiness made for absolutely gripping television. Fire, dragons, and more fire…I just can’t get enough. If you really want to light your finances on fire, it’s time to get a little cray cray. Nothing says “give myself a raise” like cutting back in some unconventional ways. Sure, you may not want to get rid of that cell phone bill. You may not think you can live without cable TV. (Lord knows that I couldn’t live without my Game of Thrones.) However, if you need a spark to get your finances moving in the right direction, making some unconventional sacrifices just may do the trick. If you want to fulfill your destiny as the King of Westeros and become a retiree, sometimes you’ve got to do what you’ve got to do to get ahead. Investing in yourself is one of the best ways to turn that financial frown upside down. Not only should you look to make an investment in yourself, you should also seek to become the ruler of your own destiny. These days, you don’t have to invade Meereen to become your own boss. Buying a nice rake or a lawn mower could be a good start. Or, maybe you’d prefer a roller and a few cans of paint. Whatever it is, find a way that you can make your own money. Start out small. Like Dany’s quest in Slaver’s Bay, it is important to learn the ropes of the business world. Create and rule over your side jobs before crossing the Narrow Sea to claim your destiny as a full-time entrepreneur. It isn’t only about filling your coffers. Starting small allows you room to make mistakes while your still learning how to preside over your own business kingdom. If you are ever going to be wealthy, you need to start nurturing that wealth now. As Dany cared for her baby dragons, you need to begin nurturing some small investments that will potentially provide you with huge returns down the road. Just like Dany’s baby dragons, these initial investments are going to need some coddling and encouragement. Yet, as time goes on, these investments are going to continue to grow, picking up steam through the awesome power of compound interest. They will become a financial force to be reckoned with. Yes, there is some risk. There’s obvi the potential for great injury and strife if you let them get out of hand. However, if you watch over them and allow them to grow to their full-potential, your investments are going to be the beasts you ride onto the Iron Throne of retirement. There you have it! 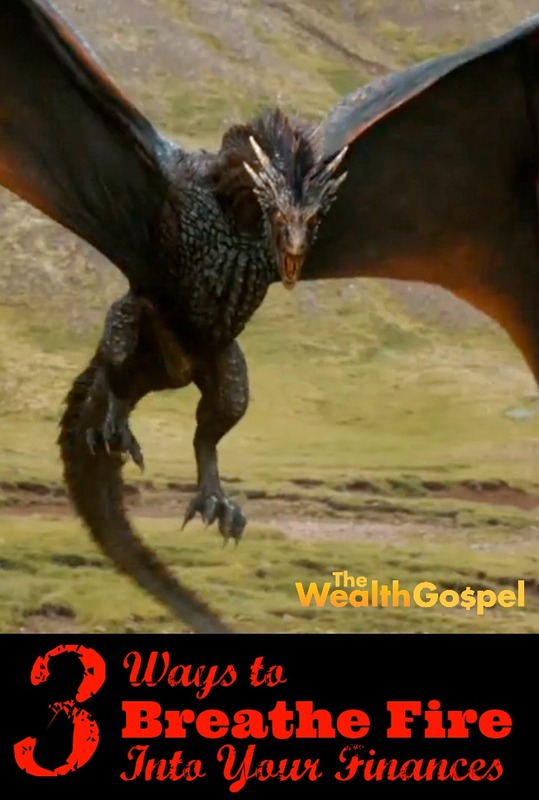 Do you have any other tips to start breathing fire into your financial situation? If so, let us hear them in the comments below. As for me, I’m going to go take a shower and scrub off the ick I still have from Sunday’s episode. Peace out!